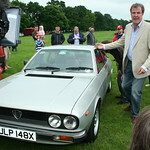 I bought the remaining stockof our local Lancia dealer in Carlisle when Lancia pulled out. I thus have a large number of new spares from Beta to Thema and a complete set of special tools - though my son, who hopes someday to get his Thema going, may not allow me to sell those. We also have a Beta coupe, a couple of Deltas and a couple of Themas in various states of decay to be disposed of. any Gamma bits in your stock ?? Don't suppose you have a VX bonnet? or an integrale Evo parcel shelf ... ? We at Betaboyz would be very interested in any Beta tools you might have. When is the séance to find out what is on offer? Know what you mean, nothing has got through to my crystal ball as yet. Why advertise then don't bother to answer! It may be because the Thema & Dedra Consortium have bought everything as a job lot....once collected and we identify what's what, the non Thema & Dedra bits will be offered to those interested.